Intrigued by Pontoon? We don’t blame you. It’s a pretty delicious flavor of Blackjack. But if you don’t know what you’re doing, the casino table game could leave a bad taste in your mouth. That’s where we come in. Whether you’re playing live or online, we’ve got the strategies you need to walk away from Pontoon completely satisfied. In traditional Blackjack, you’ll usually stand with a 17. That’s true if the dealer is showing a 6. And that’s true if the dealer is showing a 7 or higher. It’s a beatable hand, but it’s still solid. But in Pontoon, you might want to hit if you have 17, depending on the makeup of your cards. That’s because Pontoon awards 2:1 payouts for 5-card-tricks. That’s hitting 21 with exactly five cards. If you’ve got 17 with 4 cards, it’s smart strategy to hit. Sure, you might go over if that card is a 21. But if it’s a 4, you’ll win. Remember, hitting a Pontoon (a face card and an Ace) or a 5-card-trick both pay out 2:1, so it’s worth the gamble. Of course, if you’ve got three cards that totals 17, we don’t recommend hitting. That’s because your odds of getting consecutive twos are pretty low. In Blackjack, deciding when to double can be a bit of a gamble. After all, if you double down on that 10 and the dealer hands you a 2, you’ll feel like you’ve been dealt a sudden blow until the dealer finally busts (hopefully). Remember, doubling down in Blackjack means you’ll only get one card and you’re stuck with it. But in Pontoon, doubling down isn’t the end of the story. If you don’t like the card you’re dealt, you can actually hit again. That puts the power back in your hands, so take advantage. Sounds impossible right? As if a casino is going to hand you a stack of chips to play with. Well, when you play at Silver Oak Casino, that’s exactly what will happen. 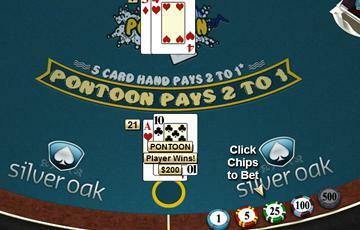 We invite you to play Pontoon for free. If you’re used to Blackjack, it’s a good idea to get a feel for the difference between the two games. Remember, while the basics are similar, there are some nuances, so the best way to sort it all out is to play with pretend chips first.